Although no Rolex can actually be considered 'affordable' – even the cheapest models retail for several thousand dollars – there are certainly some Rolex watches that are more affordable than others. Prices can range dramatically depending on the materials used in the construction of the watch, and the different features and complications that it might have; however, for those not looking to spend a small fortune on their next timepiece, Rolex still offers a variety of models at more accessible price points. Nearly every watch that Rolex now manufactures has the words 'Oyster Perpetual' printed on its dial to denote that the watch is self-winding, and that crown and case-back screw down for water resistance. With that in mind, one line of watches is actually called the Oyster Perpetual, and it represents Rolex’s most entry-level offering. 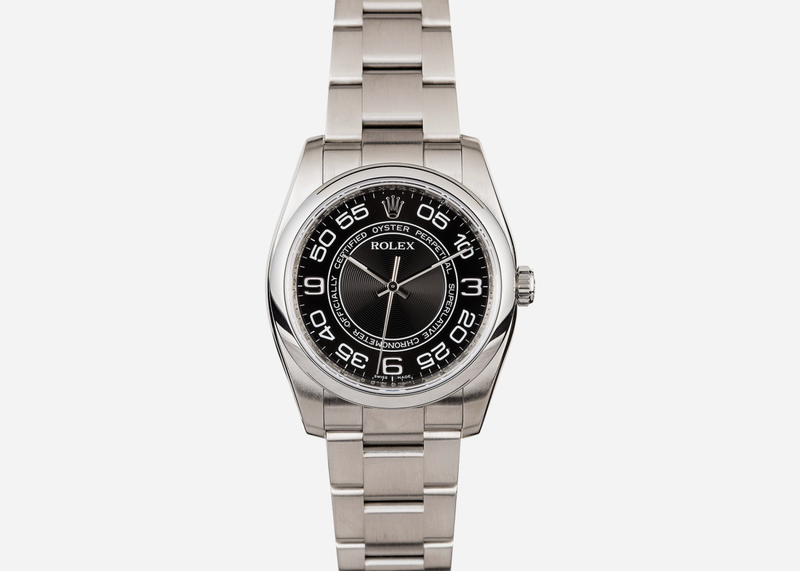 The Rolex Oyster Perpetual is a stainless steel, time-only watch that is fitted with an Oyster-style bracelet. While it lacks any specific features or complications that make it especially suited to one type of sport or environment, the Oyster Perpetual is a minimalist timepiece that embraces the core principles of the Rolex brand with perfect execution. Rolex currently manufactures the Oyster Perpetual in five different sizes, ranging from 26 mm to 39 mm in diameter. The 26 mm and 31 mm sizes are powered by Rolex’s Caliber 2235 movement, while the 34 mm and 36 mm sizes receive Caliber 3130 movements to occupy their larger cases. The 39 mm version gets fitted with the Caliber 3132, which is the same exact movement that can be found inside the contemporary Rolex Explorer. All three of these self-winding movements are certified chronometers that guarantee +/- 2 seconds of timekeeping variance per day, and thoroughly uphold the standards of accuracy and reliability for which Rolex watches are known. Although the Oyster Perpetual is available in more sizes than any other line of Rolex watches, it completely lacks any options in regards to different bezels, bracelets, or metal combinations. 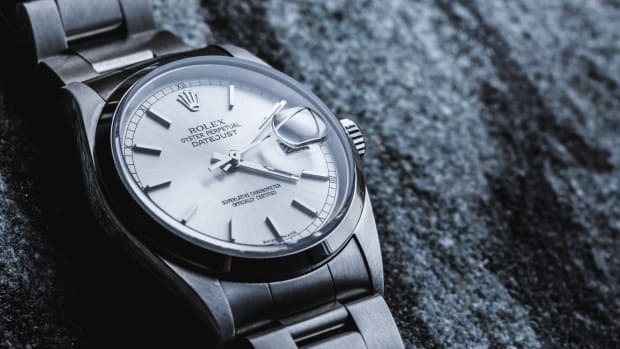 However, as a watch that embraces a minimalist feature set and occupies an entry-level position within the Rolex lineup, the options of precious metals or premium features would be somewhat of a departure from the core principles of the Oyster Perpetual. 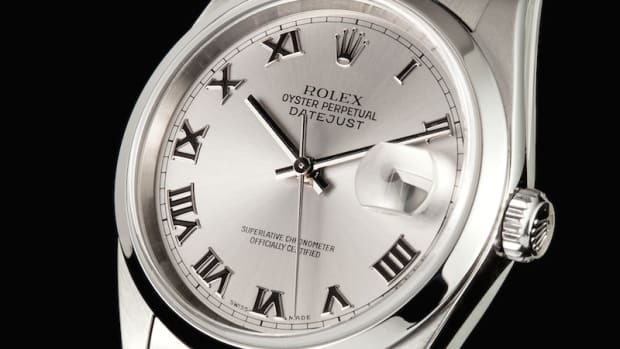 By no means is the Oyster Perpetual the most complex or opulent watch among Rolex’s offerings. On the contrary, it actually occupies the total opposite end of the spectrum, as one of the most simple and affordable lines of timepieces that Rolex manufactures. With that in mind, it has all the hallmark traits of a Rolex, such as a meticulously finished case and dial, in-house movement, and an iconic and instantly recognizable Oyster bracelet. With absolutely no extraneous features and a case diameter available for every wrist size – we like 36mm and 39mm best for men – the Rolex Oyster Perpetual is everything that defines a Rolex in a classic and highly accessible package. Much like the Oyster Perpetual, the Rolex Air-King is a time-only watch, with a minimalist feature set and a limited number of available options. Originally introduced back in 1945, the Air-King was intended to be a dedication to Britain’s RAF pilots who famously chose to wear Rolex watches over their standard-issue field timepieces during World War II. Since it was first introduced, the Rolex Air-King has always been a simple and straightforward timepiece, priced as an entry-level offering within the Rolex catalog. 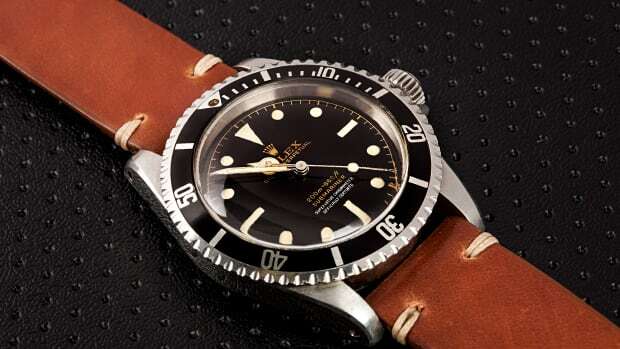 However, despite being one of the more modest pieces in the Rolex lineup, the collection is also one of the company’s oldest, although the history of the Air-King is not nearly as discussed or celebrated as those of the Submariner or GMT-Master. 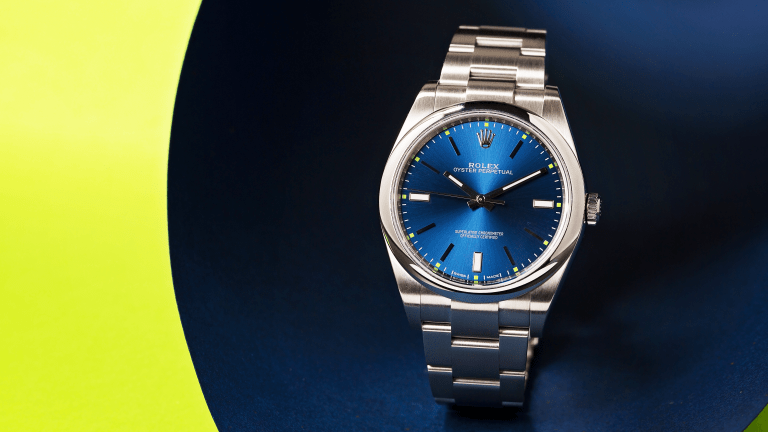 For decades, the Rolex Air-King had a case diameter of 34mm; however, in 2016, Rolex released a new, 40mm version of the Air-King that shares a case and Caliber 3131 movement with the Rolex Milgauss. Along with the physical similarities come the same anti-magnetic properties of the Milgauss, giving the current Rolex Air-King the magnetic resistance that has been a part of the history and heritage of pilot’s watches for many years. 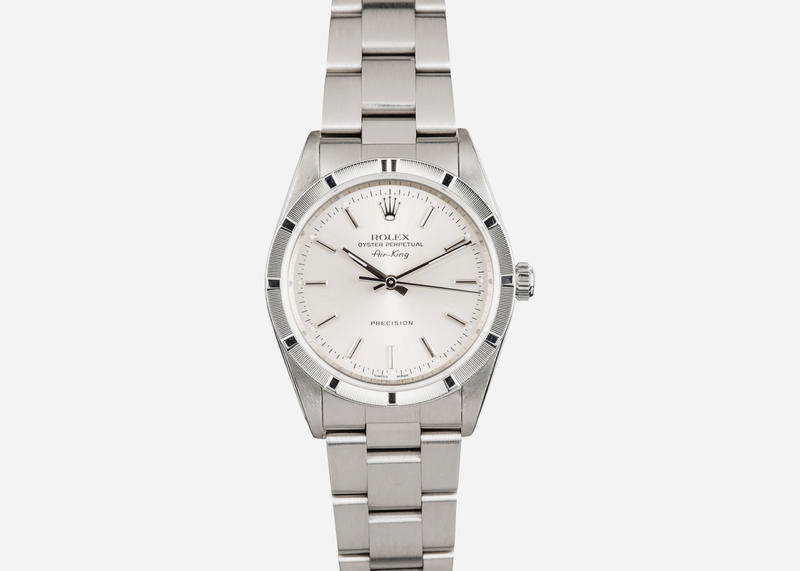 As is the case with the present-day Oyster Perpetual, the Rolex Air-King is a time-only watch with no date complication, and offers zero options as far as precious metal configurations or bezel and bracelet styles; a smooth stainless steel bezel and matching Oyster bracelet are the only options available. 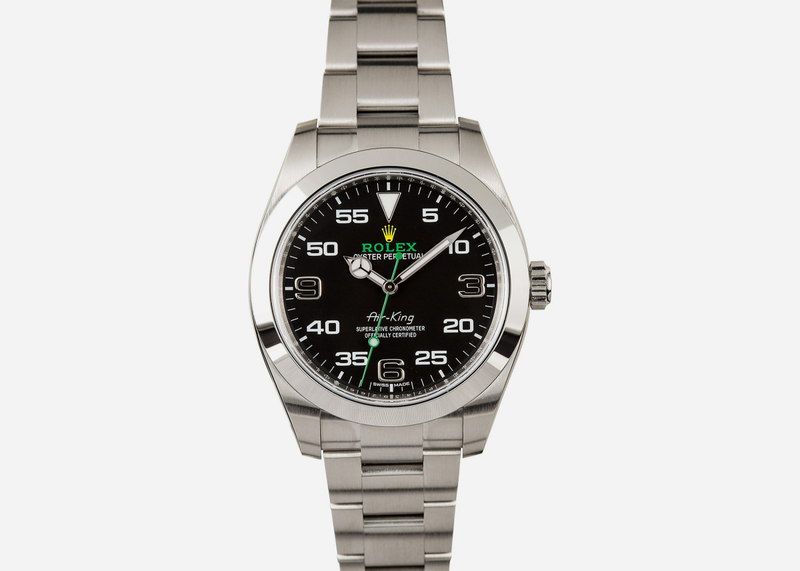 Additionally, while older Air-King watches were offered with a handful of different dial colors, a black dial is the only option available for the present-day Rolex Air-King. 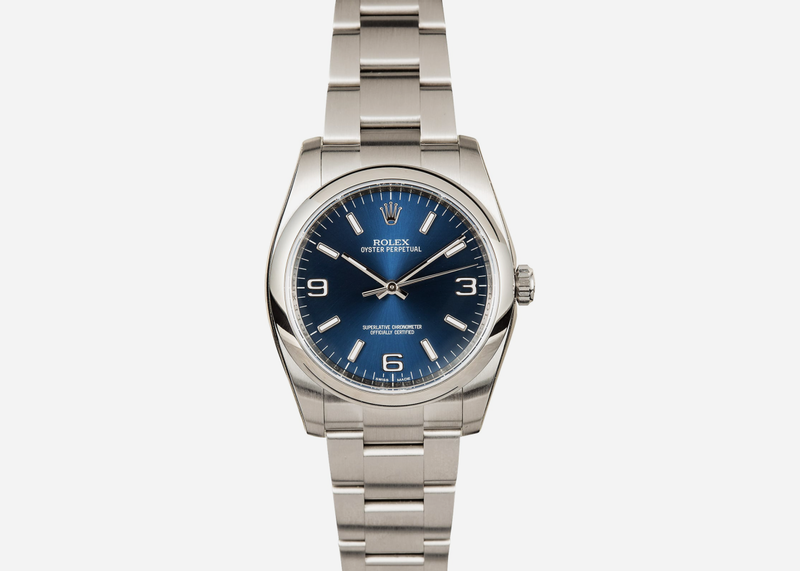 Given that the current-model Air-King is more-or-less a Milgauss with a different dial and set of hands - yet it retails for a full $2,000 less than the Milgauss – the Rolex Air-King represents one of the best values for the money among the various offerings in the contemporary Rolex catalog, and remains one of the least expensive Rolex watches currently available.